We replaced an oil fired boiler with this gas fired model. The old one used a domestic tankless coil in the boiler block as a heating zone for the finished basement. 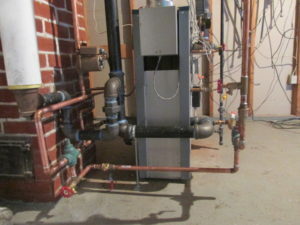 We installed a gas boiler without a tankless coil. Our installation had to be piped with two check valves, a by-pass for blending supply & return water, and either a stainless or bronze pump. This is a very unique way for a steam boiler to heat a hydronic (hot water) loop.